I was passed a link to this interesting comment from Brian Eno: “There is not enough Africa in computers” (thanks Richard). I’ve now read this a couple of times and was still left wondering quite what lay behind the comment. So I tried to find the original interview between Kevin Kelly (then editor of Wired I believe) and Brian Eno so I could read it in full. Unfortunately it isn’t on the same link anymore, but with some googling, you can find it in the Wired archive here. There are a number of really fascinating discussion points – I really recommend reading the whole article – and it provides the context for that isolated quote. I did find some of the answers a little contradictory at times though. A disclaimer, to date the music and views of Brian Eno seems to have passed me by, so these comments start with this interview in isolation. I look forward to seeing what he would say now and finding more about his ideas of generative music. On the one hand I believe he is saying he doesn’t like the “set it in motion and it will perform predictably” aspect of computers – he likes the idea of providing inspiration and guiding principles that may or may not produce something depending on the live inputs of the viewer/reader/listener – he appears to like the serendipity of it all … but later on he talks of “black boxes for music” where he has set the rules and the box produces the music according to those rules, with some input from the listener depending on their mood. The box become some combination of player and instrument if I understand his view correctly. Right near the start of the interview, he suggests that the orchestral tradition is too constraining, but I see it as a (more limited admittedly) set of programmable components ready to do the composer’s bidding. When you look at how the orchestra developed from Mozart’s time through the Romantic period, contrasting those early Classical period works with Beethoven, Brahms and then the later large scale deployments of Mahler, there is quite a lot of scope for variability there and the basic “machine” evolved enormously through that time. Then when you look at what Stravinsky did in his ballet music or what Debussy did with his completely alternative view of harmony through to the likes of Messiaen recreating birdsong in his Turangalia symphony (including incorporating the electronic Ondes Martinot), then as a “programmable box” an orchestra is actually quite a versatile person/machine system in action. I guess he doesn’t like the idea that a composer sets the rules and the orchestra is then condemned to just reproduce them. But I wonder what he thinks about jazz and improvisation? Good jazz still follows rules, but every performance is different. But it isn’t random. Is a jazz ensemble “more Africa” than an orchestra? Or maybe it is a matter of the illusion on unpredictability. When I look at something like the Long Player – that is a key set of rules, and you exactly determine what the music will be at any point – but the cycle is so long (designed to last a thousand years) that every time you dip into it, you don’t really know what you will hear. Or at the other end, is John Cage’s As Slow as Possible where you can go back after several months and the music is still exactly the same. I guess some of this relates to the difference between analogue and digital. Digital is obsessed with chopping up the analogue reality into small measurable chunks – be that discrete frequencies that we call semitones in Western music, pixels on a computer screen, or even the digitising of the end results as a digital bit stream to be played back via audio hardware off a CD or MP3. But even when digital and in theory part of a finite space, that space is so vast as to approximate to the entire musical repertoire or pictorial output of any artist, composer or musician (as least as far as human senses are concerned). I’ve always been fascinated with the idea of the computer screen representing an unimaginably large single number and that counting through them all would show every possible image that screen could display. In theory the digitisation of music could be represented the same way – if every note on the piano keyboard had a number 1 to 88, then a piece of music (forgetting rhythm for the moment) is essentially one very long base 88 number. That’s not too dissimilar to how a pianola worked, although physical layout of the cut-outs are key here, or even MIDI in today’s world, when linked with a sense of the flow of time of course. I remember my school having a dictionary of musical themes and it basically worked on those lines (although it only worried about a single octave, so it was essentially a 5-10 digit “base 7” number). I’ve always wanted that book, but so far have never seen one since. So just because things can be reduced to number and handled by computer, is that any less “Africa” than a free-flowing analogue equivalent? I guess a key distinction is not necessarily digital vs analogue, but more pre-determined vs unpredictable. In a weird way, fast forward these last 20 years and computers have become so complex as to be largely unpredictable to many. Now that these already complex machines are hooked up to the even more complex global machine that is “the Internet” (by whichever definition to choose to use – remember it is just a series of tubes), then most of us would be hard pushed to be convinced by the argument that computers are things that always behave the same way based on the same inputs. He was after unfinished pieces of musical ideas to be combined in a new form as the listener experiments. Of course, in a sense he was overestimating the listeners – today listeners want “customized listening experiences” but at the granularity of the song, the tune, not the musical extract or idea or concept. And they don’t really want the effort of having to produce it themselves. Of course they have it in droves with on-demand streaming where algorithms are “changing the parameters” on your behalf. His ideas for evolutionary music and art may still come about, but again probably more by presaging the idea of algorithms creating music and art. But does that make the algorithms the composers and painters? The jury is still out on that one, but he may well get his “furniture music” this way – his “ubiquitous 24 hours a day” music “infiltrating every waking moment of our lives”. It is interesting his view on the use of machines. He suggest we all need to be “surfing on entropy” – to be able to ride the wave of unpredictability and complexity becoming apparent. I think that is very, very apt today, but the huge irony here being that this unpredictability and complexity has come about by the very components he considered too constrained, “not enough Africa”, now being let loose as they’ve grown more powerful and complex, on the world. “When you surf, there is a powerful complicated system, but you’re riding on it, you’re going somewhere on it, and you can make some choices about it.” You either ride it an use it with skill to get your own direction, or you give up and go with the flow. There is an interesting section discussing the difference between art and science. Art “doesn’t make a difference” – in that he means that whilst art will stimulate emotions, create large emotional experiences (e.g. watching a film) then end when the experience ends. Of course, with today’s blended and mixed reality, is that still the case? A fascinating read, especially with the benefit of 20 years passing in the mean time. The context might be slightly different, but many of the thoughts are still amazingly apt for today. I’d love to know what he thinks about these thoughts again today. I had an hour spare in London yesterday so took some time to visit the Science Museum. Now this is something I like to do from time to time, if nothing else just to pop in if I’m passing that way to see if the Listening Post is still there. This time I had two aims in mind. First to catch a little of the Alan Turing exhibition, although most of it I already knew, from having visited Bletchley Park in the past. Then, from the birth of modern computing, I wanted to visit the Google Chrome Web Lab. This is a recently opened exhibition, running until June next year. So, I find the museum, wander in and immediately see the Turing exhibition, so walk through that. Mission accomplished, I walk on through the main gallery, past the steam engines, through the space section, past the ‘building the modern world’ gallery, home of the cut-in-half mini, the cray supercomputer and the ‘decades’ displays. I had a brief pause when I noticed the prototype Clock of the Long Now. This is something I have literally just read about in Richard Watson’s book ‘Future Minds’ (which I totally recommend). In the book he presents a search for slowing down, worried about how the ‘always on, always interrupting’ nature of the modern, connected world leaves no time for quiet thinking, reflection and the kind of deep thought that really leads to new ideas. He mentions the clock as a symbol of “thinking slowly”. 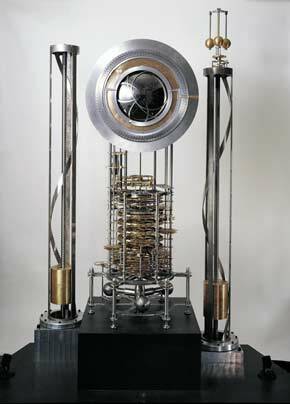 The prototype of the 10000 year clock ticks once every 30 seconds and has been installed in the science museum. The final clock is being built inside a mountain in the US (like the fictional Colossus)! The web page lists the prototype as being created December 1st 01999 – not many projects will list a 5 digit year! (reminds me of As Slow as Possible, but I could digress about such topics for ages, so I won’t!). Once past the main galleries and into the newer Wellcome Wing, an immediate right turn will take you down some steps to the Chrome Web Lab. And after all this old, long term thinking you are brought right into the current, connected present. The idea behind the lab is to make the Internet seem real. A very topical subject for me right now as I’m currently reading Andrew Blum’s ‘Tubes’ about his discover to find the real, physical Internet (but more on that another time). Of course whilst educating the populace, it has the side effect of raising awareness of Google’s own web browser technology, Chrome, showcasing its future looking HTML 5 application development ability. Google have created 6 experiments that can be run locally in the museum and online at chromeweblab.com. Visitors to the museum can see the online participants and those online can see elements on the physical displays too. Based on the kinds of Internet projects I’ve seen Google push in the past, I was very interested in seeing what they will do themselves. 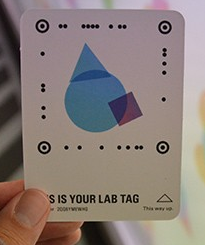 When you first walk in (or register online) you get a “lab tag” which you put in the experiments to “log in”. You can also hold it up to your webcam when you get home and link back to your time in the lab. There are five experiments in total, but the ones that really appealed to me were the Universal Orchestra and the Sketchbots. The Universal Orchestra is a set of six digitally controlled musical instruments. A marimba, xylophone, drums, tuned drums, shakers, wood blocks, etc. It is controlled by programming using a system of dots that appears to owe quite a lot to a Tenori-On. Three instruments can programmed from within the physical lab and three are programmed only online. A computer provides an ethereal accompaniment track based on the notes chosen at any one time. The continuously changing nature of the music provides a fascinating aural background to the rest of the lab. But the experiment that prompted the title of this post is the collection of sketchbots. Again, six in total, three controlled only online and three from the lab. You insert your tag and stand in front of a webcam. It takes your picture and then goes through a series of image processing steps to isolate the key lines of your face. These lines are then drawn in some smooth sand by a robot arm. There is a wonderful irony at play here. On the one hand, the robot draws your picture, the table rotates a quarter turn and in the space of three rotations your picture is no more. Washed away just like a picture in the sand at the beach. Forgotten to all. But in parallel, the digital version that allowed the robot to draw the picture in the sand has been remembered. It sits on Google’s servers, linked to your own tag to be recalled at a moments notice. How long will it remain? Who knows. “Storage is cheap”. The cloud is forever. (Note that the T&C say data will be deleted when the exhibition closes). We are in an age of digitally never forgetting. Whilst once it took lots of effort to remember – initially sharing a song around the fire, passing on tales and stories, then writing and language allowing written records. Finally the printing press allow mass distribution. Still, recording was an effort. Today it is almost totally the reverse. If it’s digital, it is remembered by default by something, somewhere. We have the technology to record every moment of our lives, but when would we find time to watch it? Many digital photos are “write only” taken and automatically preserved, but never looked at again. It is now more effort to forget digital information. Google knows what you’ve done – what you’ve searched for, what emails you’ve sent – in some cases where you’ve been. To ask it to forget is next to impossible. It will maintain your digital footprints in their digital sand for as long as its useful to them. Hence the wonderful irony enshrined in the Google sketchbots – my picture is long gone in the sand, but lives on (as does the record of my visit) online. And to me it points to a future where what was once transient is becoming permanent. Interesting Times indeed. It is very well worth a visit to the web lab – in the physical space if you happen to be passing, or online. A very nice way to spend an hour. This is really cool – a new slant on augmented reality. Take a sandpit, focus a number of cameras on it, project a load of light sources on it and add a significant amount of computer modelling and processing (I would imagine) and you can mix the real and digital in a really neat new way. As you mould the sand the computer recreates the contours in the virtual space too. Then things moving in the virtual space move according to the contours in the real space – and are then projected back onto it. Their video teasers are well worth watching – http://vimeo.com/25666910, http://vimeo.com/25665948. This could be a really interesting way to get people modelling terrain in virtual worlds or games. Ok, so this is going to be copied, pasted, and posted all around the Internet, and I’m therefore as bad as everyone else out there for basking in reflected glory – but still … I, like many others, have been waiting for an upate to this map for ages! Very glad to see it happen.